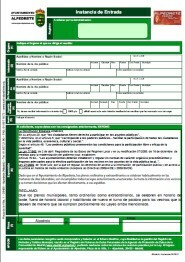 This are the translations of all Assemblies of Alpedrete Town. Thanks to Rosemarie and Anthony for their work. About one hundred and fifty people gathered in the Plaza Francisco Rabal for the assembly of the residents of Alpedrete. The assembly commenced with the proposals that are being debated and reviewed in Sol (see pertinent web pages) in order to examine the current situation and functioning of the 15 May Movement regarding the transmitting and participation via Internet, as well as the programming of assemblies and concentrations. 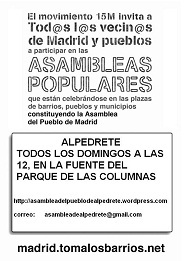 Mailing address of the Alpedrete assembly for adherence to the movement and for receiving news. The established working groups were alloted their turns to speak, (education, culture and sports, health, communications), informing of their present activities. A consensus and approval was reached on all the points made by the District Comission of Sol, in anticipation of the Popular Assembly of Madrid, Sunday 12th June. It was called for the resignation of the Conseller de Interior de la Generalitat, Felpe Puig, as the person of maximun reponsability for the police action in Barcelona. 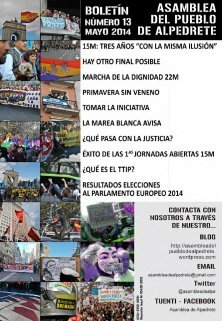 Participation in the Demonstration of 19th June, “Toma las Calles”. Periodical acts and concentrations in Sol, once the “camp-out” has concluded. Reform of the electoral law. Participation of local residents in the general assemblies. Measure for combatting orders of expulsion through mortgages. Setting up of a comission of dynamics (based on current models of other assemblies, in order to increase the flow and imporve the developement of the village assemblies. Presence at the General Assembly of 11th June, in the Cultural Centre of Alpedrete. This will be carried out in silence and with written slogans, such as “assembly in the afternoon”, thus giving a chance for workers to be present. Establish the necessary mechanisms to obtain afternoon assemblies, with turns for speakers from among the local residents. Signed petitions will be drawn up in order to be transferred to popular referendum, if needed. Each comission was assigned a place on the web page. New working groups for environment and economy were formed. Work groups and comissions must hold public assemblies, when possible in the open. For ths, an open mail should be sent to the assembly, stating day, place and time of same. Speakers and helpers for the assembly of districts in Sol were nominated. The next assembly was agreed on for Saturday 18th June at midday in Parque de las Columnas. The dynamics comission wll decide where the following assembly will take place. The comission for education, health and communications presented an account of their work. No concrete proposal was made. To make and distribute a pin of identity for the participants. A sale of books previously donated to the district assemblies, in order to help finance activities. This is to be organized by the dynamics comission of the assemblies. After studying and debating on the methods of public meetings as proposed by the “Districts Comission of Sol”, it is approved by consensus to follow these methods during meetings. Consequently, a moderator, an organizer of turns for speakers, and a secretary, are chosen. A two-hour time-limit is decided on. The name “Assembly of the People of Alpedrete” is agreed on and chosen by consensus. The assembly debated and voted at length on questions of organization. It was agreed upon to draw up a bulletin of the report on paper, to be distributed throughout the village, either as leaflets or as notices at bus stops or other public places, as well as a blog. Voluntaries were offered for both tasks. It was agreed upon to keep in constant contact with the Comission of Districts and that of Comunication of Puerta del Sol, using the web, plus any possible media at the disposal of the assemblies of villages and districts. Spokesmen were chosen for the Regional Assembly of Villalba, May 28th, strictly to inform and reach a common agreement before the general assembly of districts and villages of Puerta del Sol, on the morning of Sunday 29th May. The possibility of opening a discussion group in internet was debated on at length, but no consensus was reached. Other proposals were examined, but did not receive support; e.g. An “indignant” card, a forum in internet, organize relations with the press. It was agreed that all tasks should be carried out in previously convoked open commissions, so that anyone who wishes may participate. This was decided so as to avoid the possible manipulation by a few, and also to maintain the horizontal, open structure of the whole process. 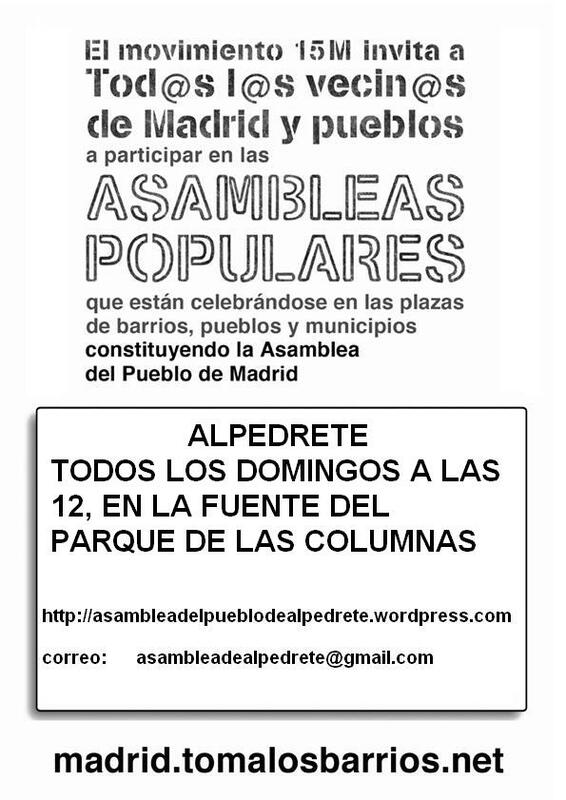 It was agreed that the next assembly should take place Sunday 5th June, at 12.00 midday, in Parque de las Columnas. An area for children, creche, plus entertainment, will be provided. A condemnation of the police intervention in Barcelona was approved amidst general applause, and support of the participants in the camp-out of Placa de Catalunya was expressed. It was decided not to make any statement concerning the continuation of the Puerta del Sol camp-out, considering the companions of the camp in a better position to evaluate the situation. It was decided to support any decision taken by the General Assembly of Sol. the creation at national level of a commission of basic rights. the creation of the mechanisms of a system for voting through internet. for the decisions to be taken through votes rather than consensus. The assembly ended at 14.14. The next assembly will take place SUNDAY JUNE 5th, AT 12, IN THE PARQUE DE LAS COLUMNAS.